This workshop is based on castles and castle life. With the basic premise being that we need to hire some staff to come and work in the Castle. 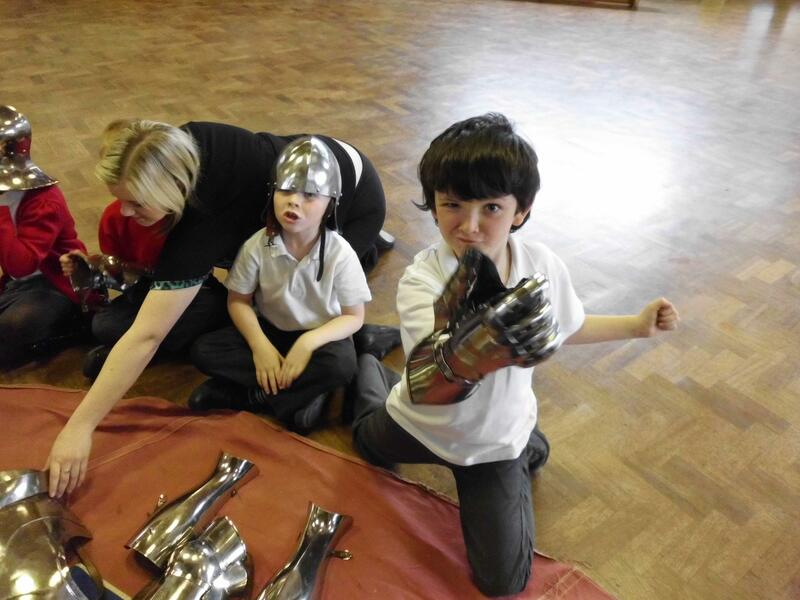 The children can learn about arms & armour, food and clothing. The display is designed to be very hands on so that every child will have a go at all the activities. Teacher requirement: 2-3 adults (depending on size of group) one of whom must be a teacher. Teaching assistants are great. But the more the merrier! Parents are also welcomed. This workshop looks at 3 topics, food & cooking, arms & armour and medieval clothes. Students are split into 2 or 3 groups within the workshop and a member of HH staff take them round the different areas of the workshop. Introduction: We introduce ourselves to the children and explain that we need to employ some people to come and work in our castle. We need knights, millers, kitchen hands and of course the students are all very strangely dressed so we’ll need to show them what they’d have to wear as medieval people, whether it be the rich lady or the peasant worker. 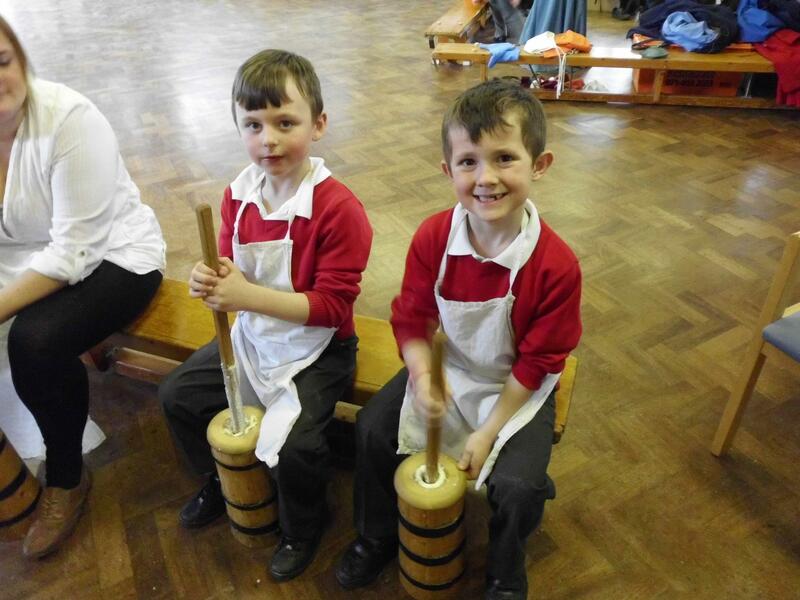 The children are then split into 2-3 groups and rotate around the different activities. 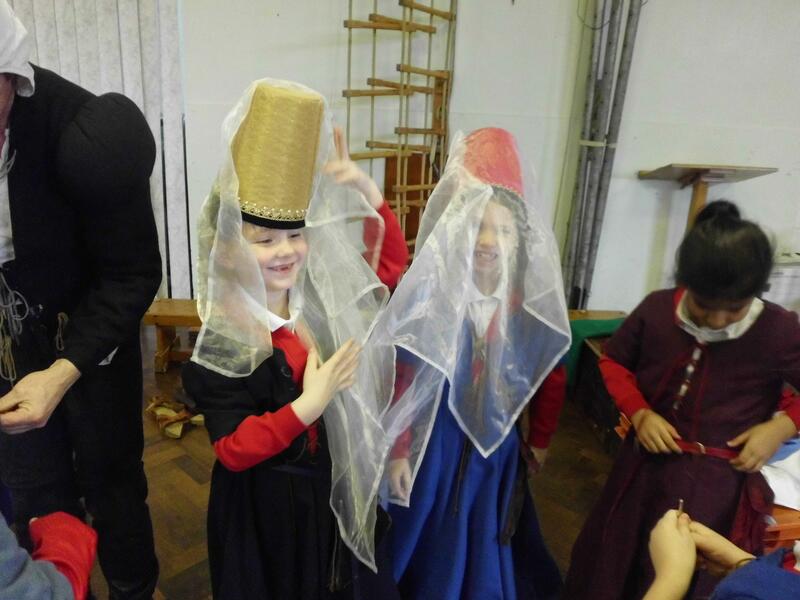 Clothing: The children learn what medieval clothes were made from by feeling & examining the different materials such as silk and wool. There are many lovely child sized clothes, shoes, hats and pouches for them to try on over their uniforms. 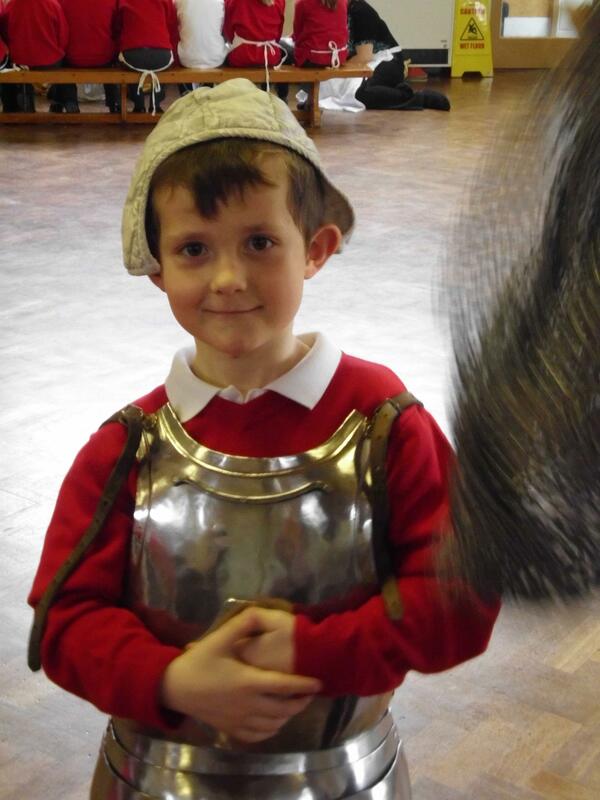 Arms & Armour: Our knight will show the children why armour was worn and where it was worn. They are then invited to try on the pieces of armour and see if they can figure out how to put the knight back together. If they have been good they are also given the opportunity to hold a real knights sword (blunt edge practice sword). The trying on of armour and sword holding are carefully supervised. Kitchen hands : The cook needs some help in the kitchen so we will need some people to help her do some jobs. 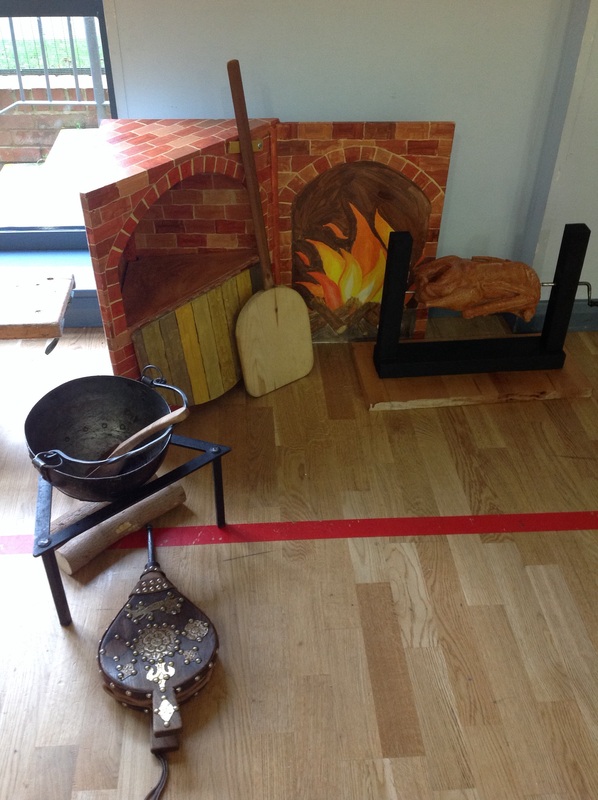 Students then learn how people cooked and made food in medieval times and compare it to how they cook and prepare food now. 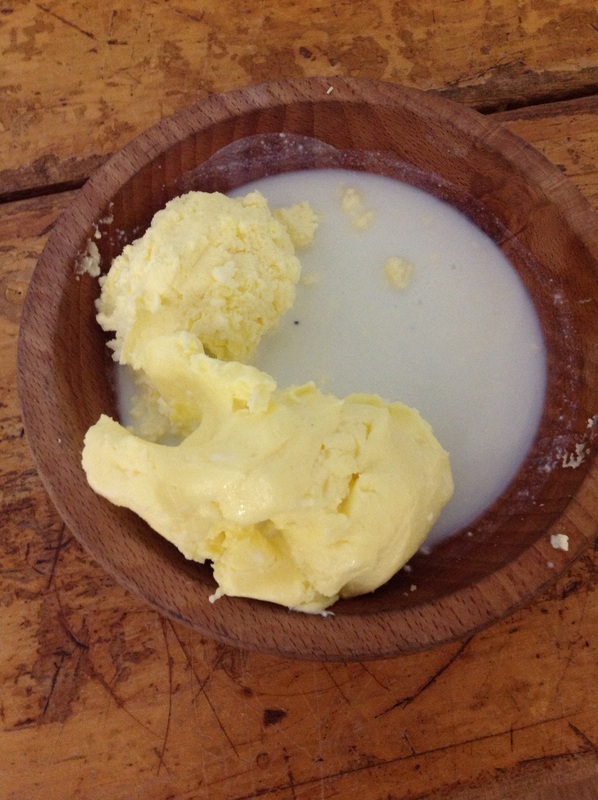 Students can all help make flour on the quern, make real butter in the churns (we have 3 churns) and pretend to cook the fabulous fake food over a pretend fire. Teachers may keep some flour to display in the classroom if they wish as students are often very proud of their work but it is not for consumption. It’s all about learning through playing! This display is a little messy but aprons are provided for this purpose and we will clean up afterwards! Summary: For the last few minutes we bring the children back to sit in one group and thank them for helping us and find out what tasks they’ve enjoyed doing the most and which jobs they might like to do. Everyone gets a chance to examine the butter and flour that they’ve made together.